Wi-Fi hotspots are one of the latest trends worldwide and are an interesting business for multiple players. There are multiple players entering this interesting business space, with a set of very diverse goals. Here are some examples of how these players are approaching the Wi-Fi market. We are going to show you the pros, cons and typical use cases of the most used business models in the Wi-Fi space. This is the oldest model. The user has to pay (credits or vouchers) to connect to the Wi-Fi hotspot. PROS: The WiFi brings a revenue to the hotspot owner. CONS: No easy access to the WiFi for users. No data capture. This is likely the worst solution if your clients expect to have free and ubiquitous WiFi connectivity, because they could reject to pay for the Wi-Fi. 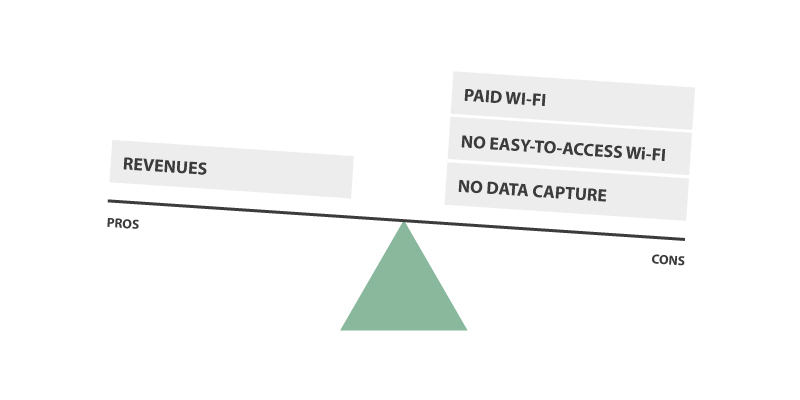 This business model consists of providing free internet in exchange for user data, which is the most important asset for the provider and for the company that offers Wi-Fi. As soon as the user registers to the captive portal on its Wi-FI enabled device, he can use the Wi-Fi network for free for a limited time. For instance, at the Heathrow Airport Wi-Fi is free for 45 minutes after registration. It’s offered by American Express that collects data of the airport’s passengers to promote its products and services. PROS: Data capture. The company that offers free WiFi can show its logo, product advertisements and promotions on the splash page, and uses the collected information for marketing and sales campaigns. CONS: Some applications, as Skype or Google Drive, eat the bandwith. 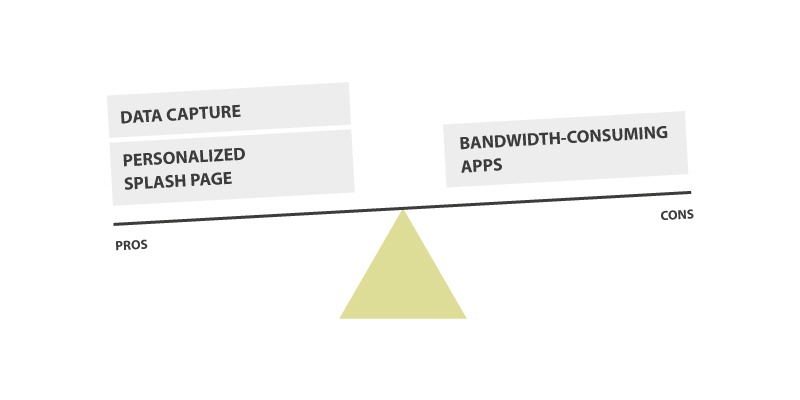 We suggest to set up a general and individual bandwidth limit and to black-list clients or ban devices if needed. The provider makes money thanks to advertising seen by the users. PROS: Easy-to-access WiFi, that users like. Free service to the customers. Revenues from advertising. CONS: The splash page should generate a high number of impressions and clicks in order to interest the advertisers and generate a revenue for the provider. Selling adv and managing advertisers is a time-spending activity. In this model, free Wi-Fi connectivity is given asking for a Facebook Like, or a Facebook post, or a Tweet, or a check-in. Whatever the goal is (Increase Likes? Increase visibility? Brand awareness? ), the hotspot owner can set up the action that the users is asked to do before connecting. PROS: Free service to the customers. Data capture. Easy-to-access Wi-Fi, thanks to the social login. If needed, clients monitoring and abuse control are available as well. Advertisements on the splash page. 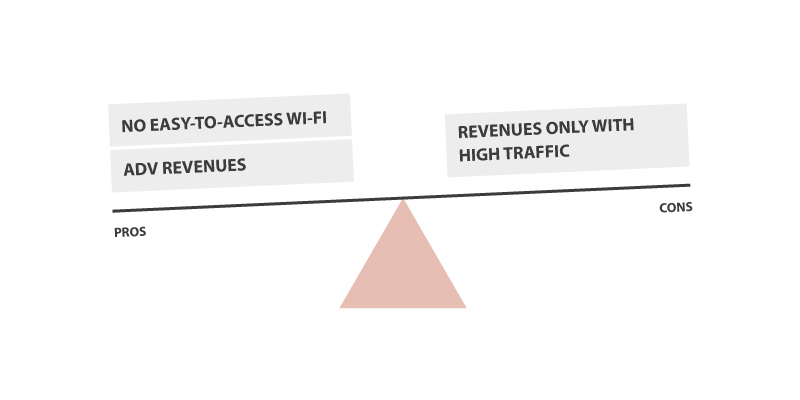 CONS: Revenues from social Wi-Fi are indirect. 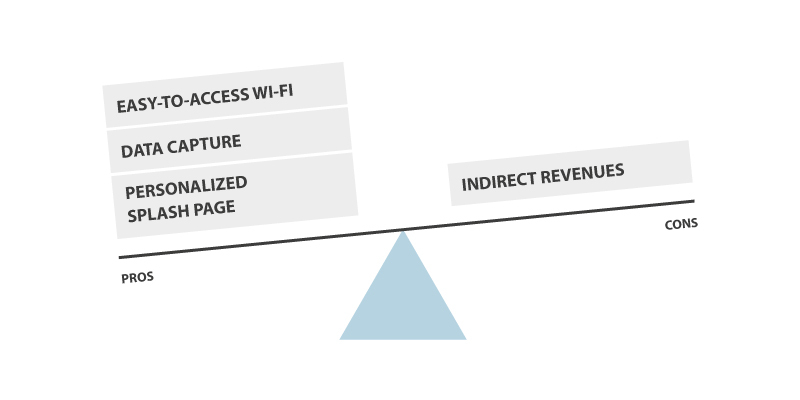 An hotel receives more bookings if its WiFi works well and it’s easy-to-access, but this ROI is not easy to measure. The word-of-mouth can bring new customers to a retail shop that gives free Wi-Fi, thanks to people that share products images on social media: but this is a indirect referral process that cannot be tracked, sometimes. Typical use cases: every public or commercial venue that has the goal to promote its visibility on social media or that needs to collect thousands of contacts for marketing activities, without spending a fortune in advertising. All these business models are supported by Tanaza!